Regina – Organic farmers who are looking for the biggest nitrogen gain from adding a pulse to their rotation might want to consider fababeans. Saskatchewan provincial special crops specialist Dale Risula told a recent workshop for organic producers that while all pulses fix nitrogen, fababeans are at the top of the list, followed by peas, soybeans, lentils and chickpeas. Adding a pulse to rotations can help break disease cycles while improving the soil. At the same time, disease in pulses because of wet conditions the last few years is a problem. Aphanomyces root rot is a particular concern. “Other than pea and lentil, which are both susceptible, you might want to start thinking about something like chickpea or fababean, which are both resistant, and soybean, which is a non-host to aphanomyces,” Risula said. Fababeans actually like wet feet and are grown mostly in the black soil zones of east-central and northeastern Saskatchewan, but crop insurance is available province-wide and research has found good yields in other soil zones. Risula said interest in the crop has grown since 2013 because companies are interested in fractionating, but that market is still in development. Most of the fababeans grown in the province are low-tannin feed varieties such as Snowdrop and Snowbird. “I think the reason for that is they’re small compared to the food types, which tend to be a little bit bigger,” Risula said. Egypt is the main buyer of food types. Livestock producers looking for fababeans want a constant supply, and that is an issue, he said. The two types shouldn’t be grown close together because they are open pollinated. 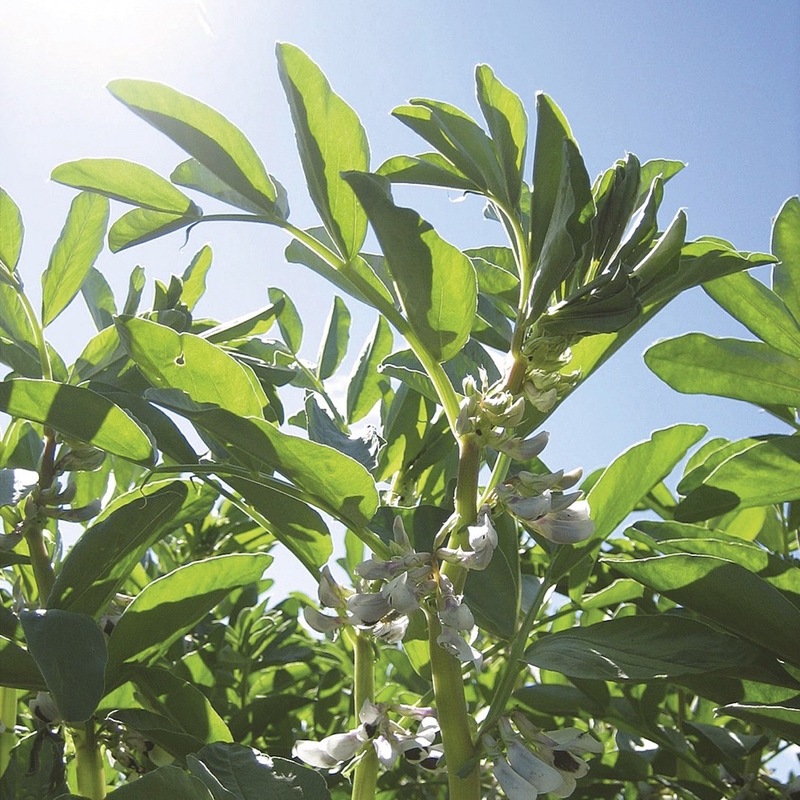 Fababeans offer good spring frost tolerance and standability. Risula said a Prairie Agricultural Machinery Institute survey of fababean growers found they recommended decreasing ground speed while seeding, seeding in two passes, using extra coarse options for metering, screening out the largest seeds, removing blockage sensors, increasing air speed and watching for sagging hoses where blockages could occur. Fababeans need considerably more phosphorous than some other crops. Sixty pounds of phosphorous are needed to obtain a 50 bushel per acre yield. “They tend to like to use existing fertility and not fertility that’s added with the seeding operation,” Risula said. Only one-quarter of the flowers will actually form pods, he added, likely because of a lack of pollinators and/or heat stress. Pests include lygus bugs, aphids, grasshoppers, pea leaf weevils, blister beetles and leaf hoppers. The crop turns black from the ground up at maturity of about 107 days. Risula said straight cutting at 15 centimetres off the ground is a recommended harvest practice.